At the north end of Brookside Park, the ballpark was named for Jackie Robinson on January 30, 1988. Pasadena City College baseball team plays their home games on this field. Two Mexican Fan Palm Trees planted at the east entrance to City Hall, on Euclid Street. 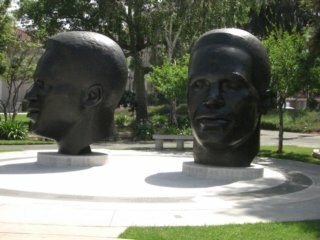 Bronze portrait sculptures commemorate the lives of brothers, Jackie and Mack Robinson, located on Garfield Avenue, north of Union Street, across the street from City Hall. Mack Robinson won the silver medal in the 200-meter race in the 1936 Olympics. Jackie Robinson broke the color barrier in baseball when in 1947 he joined the Brooklyn Dodgers. Two plaques mark a small orchard of trees across Garfield Street from City Hall, south of Holly Street. One plaque commemorates the sister-city relationship between Pasadena and Vanadzor, Armenia. 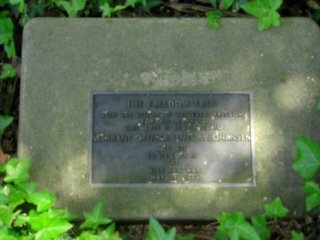 The other plaque reads, “These trees dedicated to the International Friendship between Pasadena, Ludwigshafen, Mishima and Jarvenpaa. Pasadena Sister City Committee December 1988”. SW corner of Colorado Blvd. & Orange Grove Blvd. Alongside the path that extends west from Grand Ave., is a drinking fountain made from river rocks. There is a plaque, but it has rusted over and is unreadable. Designed by Walter C. Beckwith. Dedicated Wednesday, January 27, 1954. Rededicated November 12, 1986 when a new plaque replaced the original marker, which had been stolen. A green sandstone wall and a bench at the corner of Orange Grove and Colorado are made of stone from the 1890 building of the Pasadena Public Library. A plaque bears the names of the 27 original colonists of Pasadena, which are also listed in the Pasadena Post, June 3, 1937. Another rock, inscribed “Founder’s Square” was described and pictured in an undated article (after 1949). The article claims that the rock was found when workmen were widening North Orange Grove Boulevard, and was moved to a warehouse for safe keeping. Dedicated February 12, 1927, to the men and women of Pasadena who served in World War I (WWI). Designed by Bertram Grosvenor Goodhue and built by Lee Lawrie. List of Pasadenans who gave their lives in WWI is in the Star News, February 11, 1927. Originally stood in the center of Orange Grove/West Colorado intersection. Moved to the NE corner because it was declared a traffic hazard. Inscription reads: “In Proved Remembrance of Our Glorious Dead MCMXVIII”. Unknown who placed it or when it was erected. Reads “Defender’s Parkway Dedicated by Mothers of the Defenders of the Flag Soldiers Sailors Marines Who So Gallantly Responded to our Country’s Call 1776 1861 1898 1917”. Bronze plaque at the southwest corner of Orange Grove and Colorado Blvd., identifying the spot as the city’s heliport. Originally on the Pitch & Putt golf course @ Carmelita Gardens to honor Lt. Orrin Russell Fox, who died in World War II (WWII). Moved to Pasadena Art Museum because of freeway construction. Moved again to Orange Grove and Colorado, near the Pioneer Plaque monument. An Italian Cypress was dedicated to Leonard J. Pieroni in May 1996 by Pasadena Chamber of Commerce. Reverend Lawrence Signey officiated the ceremony. Pieroni died on April 3, 1996 in an airplane crash in Croatia. A third plaque to recognize Lieutenant Oldfield’s accomplishments in expanding the heliport facility is placed at the trailer building, which is called “Oldfield Annex”. It is not a memorial, as Oldfield is still living. Jackie Robinson’s mother, Mallie Robinson, bought the house in 1920. She moved in with 16 month old Jackie and her 4 other children. They were the first African-American family on Pepper Street. The Robinson house was torn down in the early 1970’s. On October 31, 1993, three youths, Stephen Coats, Reginald Crawford and Edgar Evans, were shot on their way home from trick-or-treating. The community was devastated. John Muir High School responded with a memorial to their students, Stephen Coats and Reginald Crawford. 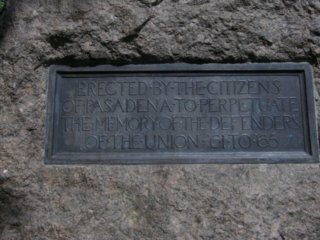 Raymond Ave & Walnut St.
Inscribed: “Erected By The Citizens of Pasadena To Perpetuate The Memory Of The Defenders Of The Union ’61 to ‘65”. Two Batchelder tile fountains, dedicated in 1932 by the Daughters of Union Veterans of the Civil War to American War Mothers. Inscribed: “Dedicated To Our Mothers By Daughters Of Union Veterans Of The Civil War 1861 – 1865”. These fountains were badly damaged in 1990 when Memorial Park was re-landscaped. Fountains were rebuilt from the salvaged pieces. Plaque reads: “1732 – 1932 Bicentennial Trees, Planted by Pasadena Chapter D.A.R. March 4, 1932 In Memory of George and Martha Washington”. Dedicated on Memorial Day, 1930 by the American Legion. Stone building of Romanesque architecture erected here in the 1880’s, financed largely by public subscription. Served as Pasadena’s main public library from 1890-1927; condemned as unsafe in 1933; razed in 1954. The date inscribed on the Archway stone is July 4, 1887. Severely damaged in the 1994 Northridge earthquake and subsequently fenced in. Dedicated Veteran’s Day, 1993, City Hall Rotunda. Rededicated Sunday, October 24, 2004 in Memorial Park. Triangular shaped granite and bronze structure honoring Pasadena servicemen killed or missing in the Vietnam War. Inscribed with names of 31 men (no women from Pasadena were killed in Vietnam) also listed in the Star News November 12, 1993. Located west of the Gold Shell in Memorial Park. Dedicated to “Godfrey Post of G.A.R. Erected by John F. Godfrey Post G.A.R. June 14, 1912”. “G.A.R.” stands for “Grand Army of the Republic,” an organization of Civil War veterans who fought for the North. Not found upon inspection of park, March, 2007. Fair Oaks Ave. and Pasadena Ave.
A series of historical markers that pay homage to Pasadena’s earliest settlers, merchants and businesses. 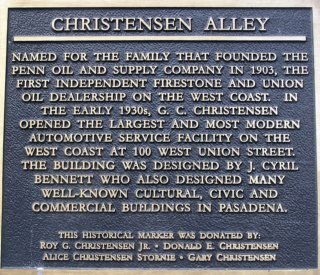 There are more than 40 markers scattered throughout the 22 alleys that crisscross Old Pasadena. Some alleys have more than one of the 9 x 12 inch markers. 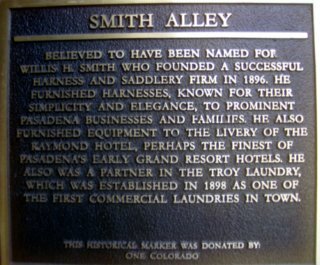 Examples include the plaque on Baker Alley, which runs parallel to Fair Oaks between Dayton and Valley, named for John Hamilton Baker, who was one of the original 27 settlers, and the plaque at Mercantile Place, between Fair Oaks and Raymond. 2007 – Temporarily removed for the construction of two new conference buildings. Dedicated January 27, 1974 by the Pasadena Foreign Cities Affiliation Committee. Located on the west side of the Pasadena Civic Center. The Plaza consists of walkways, a large fountain and a sculpture. Ludwigshafen and Mishima Plazas, both designed by landscape architect Lawrence Halpern, were part of the original plan for Pasadena Center. At the south end of Ludwigshafen Plaza stands the Moreton Bay Fig, a Pasadena landmark. Ludwigshafen Commemorative Pylon, an aluminum sculpture that stands in the fountain, is a scale replica of a 40-ft. column in Pfalzbrau Plaza, in Ludwigshafen, Germany. Dedicated May 3, 1974, by the Pasadena Foreign Cities Affiliation Committee. The central feature is a 300-seat amphitheater, which has been used for outdoor lectures and musical performances. Designed as part of the Pasadena Convention Center, by landscape architect Lawrence Halpern. An obelisk stands in the rose garden in Mishima Plaza, carrying the phrase “May Peace Prevail on Earth” in English and three other languages. A series of plaques on a large column outside the Police Station entrance, dedicated to all officers killed on duty in the department’s history. The park was originally planned as part of a proposed Eaton Wash recreational project, which was slashed when the new Pasadena High School campus was established on part of the planned complex. (Pineda, Manuel, Pasadena Area History, p. 65). The base of the flagpole at the corner of North Altadena Drive and Paloma Street in Victory Park has a plaque provided by Gold Star Mothers. The flagpole monument was cleaned and the green concrete base was restored in 2004. The original V-shaped rose garden was replaced with a large concrete “V.” The original plaque remains. Pasadena Star News May 31, 2004. Set in a large native boulder along the walk in the center of the children’s play area in Victory Park, a bronze plaque has the insignia: “United for Service National Exchange Club”. Inscribed: “This playground equipment is dedicated to all children of the community by the Exchange Club of Pasadena August 11, 1964. A plaque at the corner of South San Rafael Ave. and La Loma Road commemorates the deaths of three Pasadena Water and Power Department employees who died July 12, 1990, caught in an electrical vault explosion near that corner. A plaque placed in a granite boulder stands in memory of Ralph Alexander and Johnny Long, who were killed in an underground explosion in 1962, as well as the three men killed in the 1990 explosion in the San Rafael area. 391 S. Orange Grove. Blvd. Located in the rose garden on the north side of Wrigley Mansion, honoring Vietnam War dead, esp. Warrant Officer James Johansen, who died in 1968. Johansen’s mother, Mrs. Barbara Johansen, gave the tree to the city. SW corner of Washington Blvd. and Lincoln Ave.
On the Southeast corner of Washington and Lincoln, at the base of the flagpole, is a plaque in tribute to William Henry Harrison. Seco St. and Rosemont Ave.
S. Arroyo Blvd. between Norwood Dr. and California Blvd. The South Arroyo Boulevard area between Norwood Drive and California Boulevard was established as a Bird Sanctuary and includes a fountain designed by Ernest A. Batchelder. Certain pieces of the play apparatus at Grant Park have small brass plates attached attesting that they were donations of the Pasadena Kiwanis Club. Ave. 64 and Colorado Blvd. Designed by Patricia Ferber, a local artist, using river rock and stone slabs, in memory of Betty Hogoboom and her son, Peter. Betty Hogoboom was a longtime volunteer in education and cultural activities. Peter Hogoboom died of AIDS. Located in San Rafael Park. Orange Grove Blvd. and Sunnyslope Ave. Located in Gwinn Park is a grove of trees dedicated to Pasadena’s mayors. 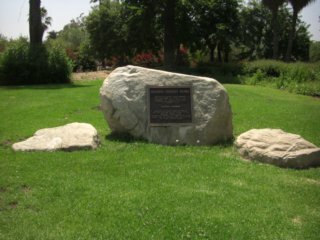 The park was dedicated October 8, 1972 by the Pasadena Beautiful Foundation in memory of Floyd Gwinn. The park, located at Orange Grove and Sunnyslope, was previously known as Sunnyslope Park. Also in Gwinn Park is a Camphor tree planted in memory of Ted Huggins, the 6th president and a founding member of the Pasadena Beautiful Foundation. Located at the corner of Arroyo Blvd. and Westgate. Dedicated June 11, 1989 by the East Arroyo Residents’ Association. Ruby McKnight Williams was a civil rights pioneer. A bronze scroll plaque set in a boulder placed in the island of the approach road south of the Rose Bowl entrance dedicated the Newell Bikeway at a ceremony and gathering of bicycle enthusiasts on May 21, 1966. In the Playhouse Paseo, the court between Vroman’s Bookstore and the adjacent theater, a plaque has been placed in memory of William C. “Bill” Reynolds, the Director of City of Pasadena, Housing and Development Department for 20 years. His accomplishments include the revitalization of the Pasadena Playhouse District. Reynolds died in 1999. SW Corner of California Blvd. and St. John Ave. In the remnant area of Tournament Park a plaque placed into a retaining wall records history. “Historical site – Tournament Park. Official terminus of the first transcontinental airplane flight. Calbraith (Cal) Perry Rogers took off from Sheepshead Bay New York September 17, 1911, landing here November 5, 1911. Earlier flights – Roy Knabenshue piloted his dirigible from here March 29, 1909. Charles Willard landed here in his airplane March 31, 1911.